Women's Refined Slim Fit Tall Gloss Rain Boots is rated 4.2 out of 5 by 172. Con un ajuste más ceñido para la vida urbana, la bota de agua alta Refined incluye un diseño personalizado y una estructura con menos capas de caucho para aportar una sensación de mayor ligereza. Elaborada a mano y completamente impermeable, esta bota de agua para mujer con un acabado brillante combina a la perfección funcionalidad y estilo para ofrecer un aspecto elegante en los días de lluvia. Rated 5 out of 5 by Lia Lo from Beautiful boots Purchase a few weeks ago but sadly had to return them. I order a size 9 shouldve order a 10 instea. However, they still get a 5 star rating because they are absolutely beautiful! I love how classy they look. They do run a big snug since it’s a slim fit size so go up a size. They are definitely not made for a wide calf but the name of the boot says it all. Rated 5 out of 5 by Alex from Love! I bought tawny color and I'm in love with them. The slim fit is perfect they look elegant. I recommend this product! 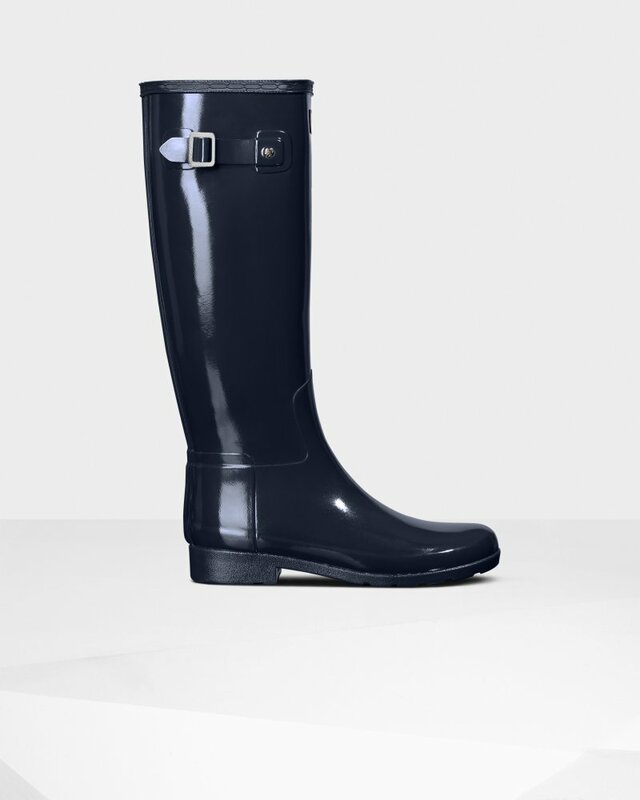 Rated 4 out of 5 by yellowtulip from Love the look Love the look of these rain boots. I have in the tan. I am a 7.5 and often size down, so got a size 7. They were ok in the length, but heel hit funny and the top was tight across the top of my foot. So, I ordered the 8 and am much happier. They are still not the most comfortable boots in the world, but they do the trick in the crazy wet winter we are having. Rated 4 out of 5 by HeidiL from Very happy Fits great. I'm a womens US 6 and bought a US 5. Happy with the fit. The right boot had a spot on the upper that occasionally hits the top of my foot, but i think that's more me that the shoe itself. Would purchase again. Rated 5 out of 5 by Kstew from Probably size up Definitely a much more narrow foot than my other hunter boots so definitely size up if you plan on wearing the boot socks with them! Rated 5 out of 5 by Nim0 from Love love love! I purchased these about a month ago and I’ve worn them twice since. I have a narrow foot so rain boots usually never work for me. These fit not only my foot but my calves perfectly. I’ve gotten so many compliments on them so far. I can’t wait to wear them again! Rated 5 out of 5 by olliegeez from It was returned My wife, unbeknownst to me, had already purchased a pair of Hunter boots (albeit a diff style) that she preferred so she returned these. Seemed like quality, however. Rated 5 out of 5 by Nessa from Perfect in every way! I love the fit (true to size), I love the color and they arrived quickly.